NuLEDs patented PoE technology enables highly customizable environments and is ideal for office, education, healthcare, and data center settings. Reduces TCO including a lower initial investment, lower operating expenses, and a lower cost of space-reconfiguration. Creates personalized employee workspaces that improve safety, comfort, and productivity. Software that provides a simple and intuitive web-based interface for commissioning, controlling and monitoring connected devices. NuLEDs Power over Ethernet (PoE) intelligent controls plug into a standard Ethernet switch, and is controlled through management software by NuLEDs or one of our partners. Wall switches and sensors plug into any fixture, and can control devices on the network. 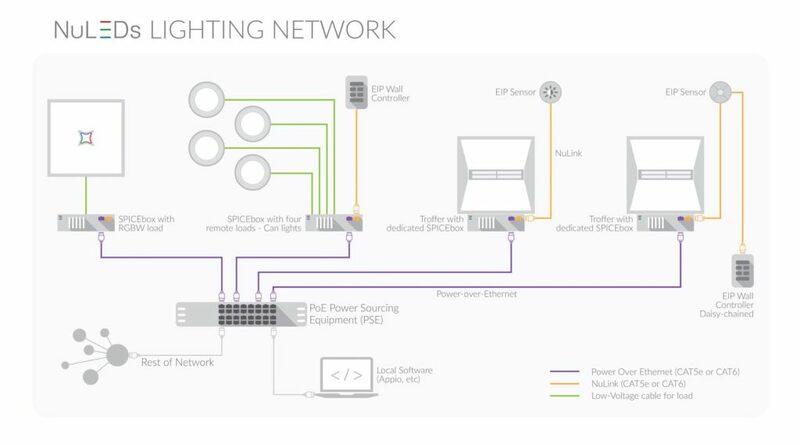 NuSPICE Architecture consists of the NuLEDs SPICEbox, peripheral wall controllers and sensors, and management software on a standard IEEE network.